Products used: GU Roctane and GU Brew, Synergy Adrenaline Wetsuit, Cobb V-Flow Plus Saddle, Jamis Xenith T1 Tri Bike, Rudy Project helmet. There were a little over 3000 athletes in the race, which was surprising as most of the races I have done are only a couple of hundred. Since I am a mountain biker and not much of a roadie, I don’t own aero wheels. So, a week out from the race, I took a look at the weather report and it was forecasting 10mph winds with 25 mph gusts. Not wanting to be blown off the road, I decided to forego a disc, 808s or whatever. Instead, I secured a pair of Reynolds Assaults (~45mm) wheels. Of course, to my disappointment, the forecast changed and there was no wind. Arrrgggh. Too late to get anything else. 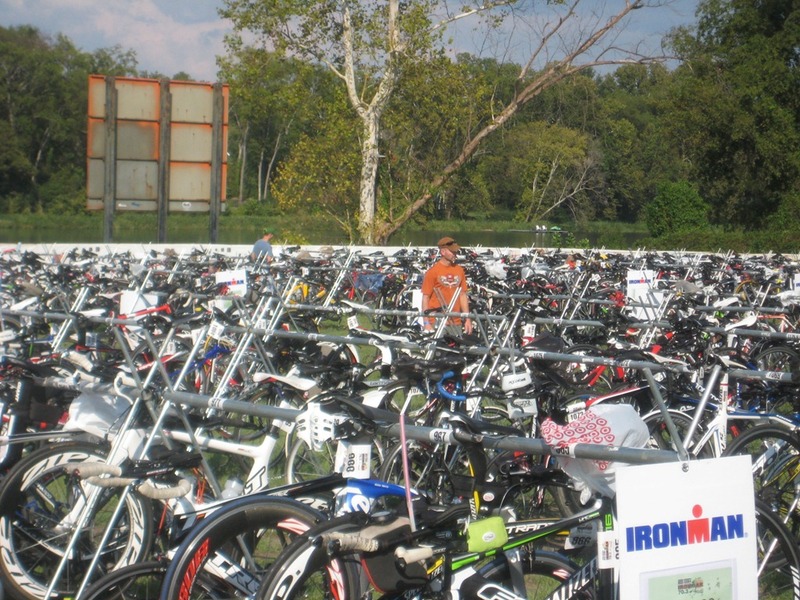 It being my first Ironman race of any sort, I was very, very surprised at how organized and smooth flowing the check-in process went. Smooth as butta. Despite the number of people there, I was checked-in and had everything ready to go in about 10 minutes. It took me longer to find a parking spot than it did to get through the check-in. 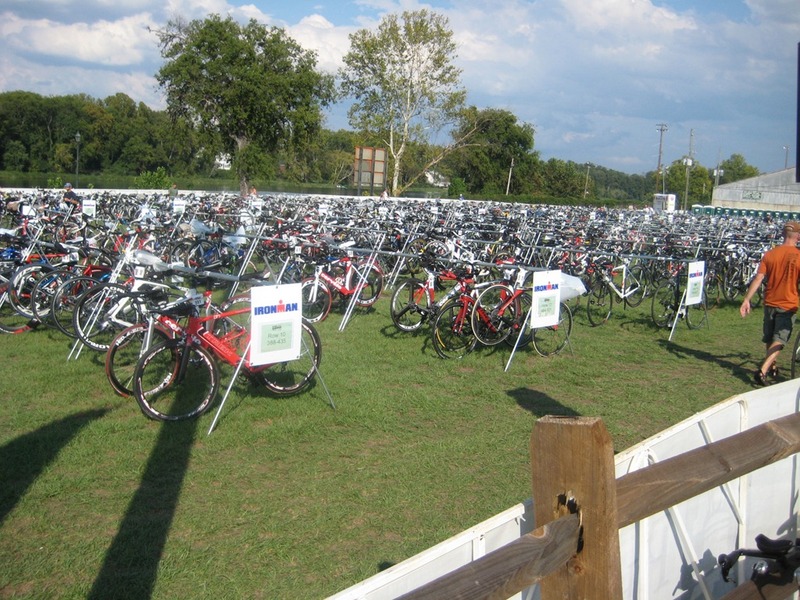 The transition area was huge and there was an endless sea of bikes (the port-a-pottys in the pic below should give you some perspective, not to mention the swim and run in arch in the distance). I walked around transition a bit to get acclimated with where everything was and some point of references to where my bike rack was located. I got everything in place, kissed my bike goodnight and headed to the hotel. One hassle/disappointment was the fact that since it was a point-to-point swim, we had to check our bikes into transition which was 1.2 miles away from the swim start. Made for a bit of a hectic race morning, but it would be the only hassle of the day. I don’t know how many swim waves in total there were, but I was in number 12. My age group, Men 40-44, had 504 competitors in it alone. So for only our age group, there were three waves of swimmers. It was broken alphabetically and I was in the first wave of our group. 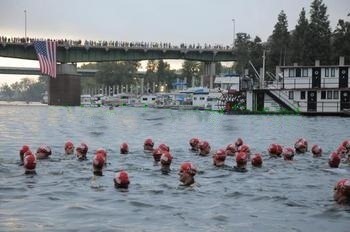 People lined the bridge we would swim under in order to watch the swim. Hanging from the bridge was a HUGE American flag which was very cool indeed. We slowly made our way to the river and with the sound of a horn were off. In usual fashion, it was a bit of a washing machine start. Since we were swimming down-river, I decided to swim as close to the buoys (as far from the shore as possible) in an attempt to catch as much of the main channel current as I could. Several times, the current tried to pull me further out into the channel, but with a slight correction, I was back on course. By the time I reached the swim exit, I had caught up with the tail-end of the previous waves. I was one of the first swimmers in my wave to exit. 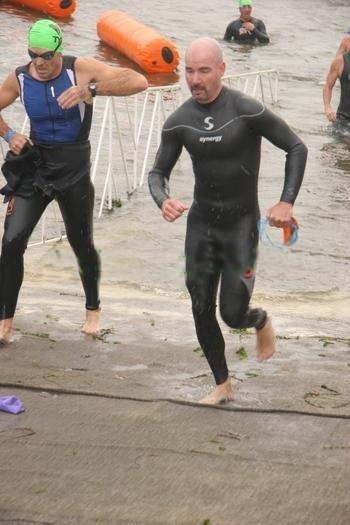 I would later find out that I was ranked 37th in my age group for the swim with 25:05. Again, the transition area was HUGE and after running what seemed like forever to get all the way around transition and then to my bike rack, I finally realized why there were 5 and 6 minute T1 times. I came in at 3:59 Ugh. 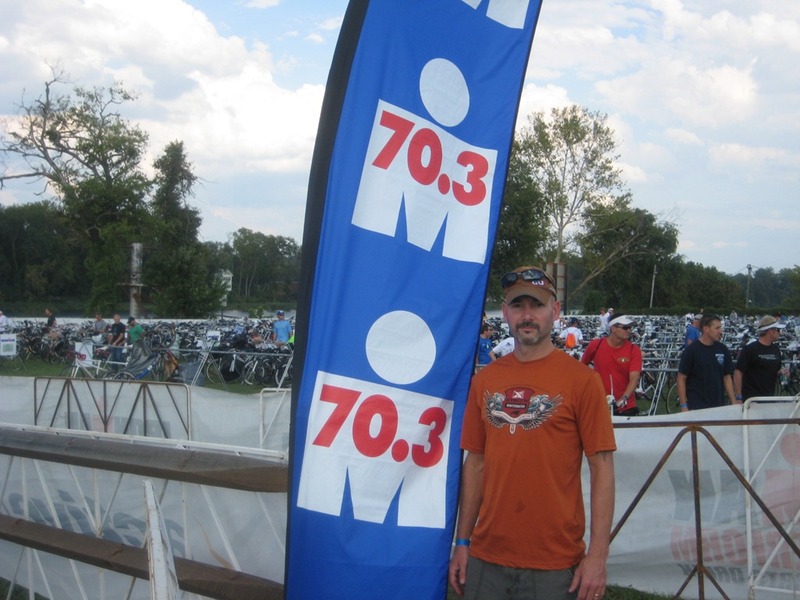 Not having raced a 70.3 before, I wasn’t quite sure what kind of goal to set for the bike. I had done a few calculations to figure out where I would be at in the standings (based on last year’s results) depending on what average speed I maintained. As the bike leg progressed, I just maintained as hard of a pace I could while still maintaining something in the tank (leg-wise) for the run. I spent the entire leg of the race passing folks in previous waves and was passed by a few in my age group. The country-side was absolutely stunning and there were often people sitting in their driveways clapping or cheering you on. One exception was some greasy-looking fella standing in his driveway holding a sign stating, “Go Home. Get off this road.” I guess he didn’t like us bringing all of the economic stimulus to his community. Every water stop was well-manned and had a ton of opportunities to grab water, other fluids or gels. There were at least 15 or 20 volunteers in a row holding something out. They did an outstanding job yelling out what they had to offer. I took water at two stops and they were passed off perfectly without having to even slow down. I think it helped that I would look right at the volunteer and point to them to signal I would be taking their offer. I maintained a pretty steady pace without over-doing it. 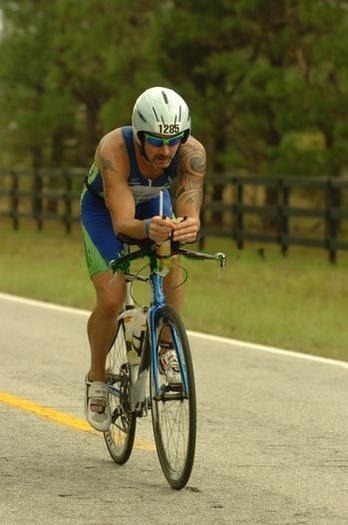 Even with all of the passing going on, I only lost 3 spots on the bike and dropped to 40th in my age group with a time of 2:32:43. The run is usually my strength and this would hold true for this race. 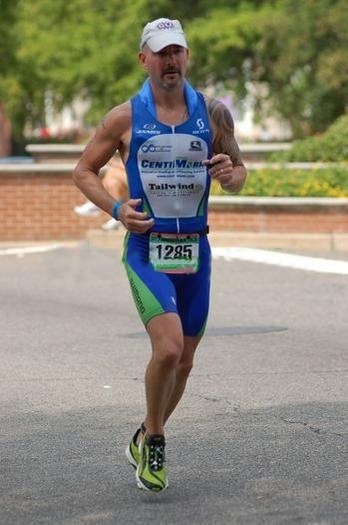 I was off onto the run, again just trying to maintain as fast and consistent pace as I could. I figured consistent was probably just as important as speed. About a quarter-mile into my first of two laps, I was passed by Amanda Lovato on her second lap. Was kinda cool to see one of the pros run by. I didn’t even attempt to keep up with her. I joked however and said to her that if she was going to pass me, she had to at least throw me a tow-rope. She chuckled slightly, but I could tell she was pushing pretty hard. I maintained a 7:20 pace for the first lap and was pleased. My goal was to maintain the same pace for the second lap. As I came into a water stop at mile 8, I grabbed and chugged a cup of water and began to choke a little. I stopped to walk it off which proved to be a bad, bad thing. Before I knew it, I had walked through the entire water stop, wasting valuable time. I told myself to get moving and was doing fine until I got to the stop at mile 10 (or so). I grabbed ice and a sponge and fiddled around with trying to get the ice down the back of my suit, again wasting valuable time walking. I got moving again and quickly returned to my 7:30ish pace. I would finish up the second lap at 8:26 pace bringing my entire run down to 7:53. The good part is, I managed to pass 28 people on the run in my age group bringing me up to 12th place. If I would have maintained my 7:20 pace, I could have gotten 9th. Primary lesson learned: Keep running. Do not stop at the water stops and get your business done on the run. Previous Post: Adapt, Improvise and Overcome. 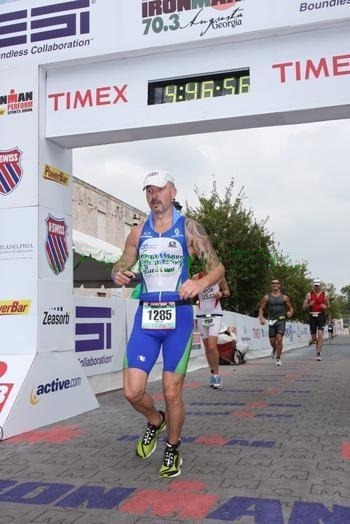 Multiple Race Report. Good job, Marcus! Awesome write up too.